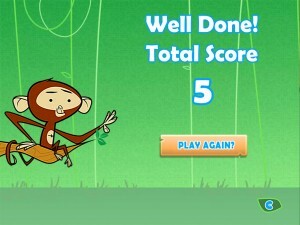 Monkey Doh has been re-developed from the Flash original, using the PhaserJS Mobile and Desktop framework. Monkey Doh helps players develop a sense of relative pitch by learning to identify a intervallic movements from a given starting note. Players hear the melodic line and then have to move the available note(s) over the stave to the positions of the notes heard. This will help train musicians in their appreciation of intervals within the diatonic scale. It therefore supports the elements of general musicianship addressed by the graded examination system and the National Curriculum. 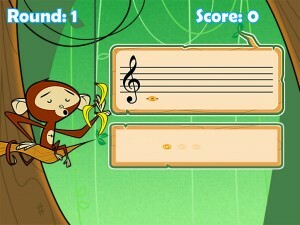 The game has a jungle theme with a monkey (called Marcel) that sings in a clear but amusing voice the notes in each round of the game. Everything hinges around bananas. 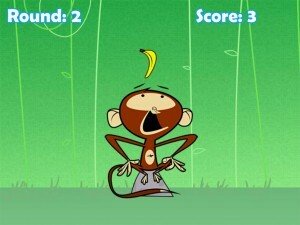 The player has to win bananas for the monkey. This entry was posted in ANDROID, Android Games, EDUCATIONAL GAME, HTML5, HTML5 Games, iPad Games, iPhone Games, PHASER and tagged Android Game, cross browser game, Educational game, Flash to HTML5 conversion, music game, Phaser. Bookmark the permalink.